This past weekend we loaded up and headed west to visit my family. It was the first road trip for the boys and they did amazingly well sitting in the van for six hours. Although they kept telling us how long of a drive it was after we were only on the road for an hour! 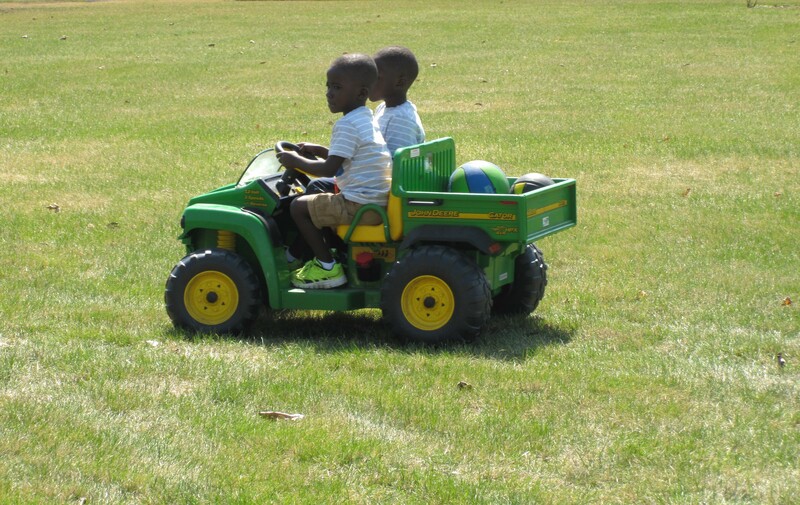 We spent almost the entire weekend outside and it’s safe to say the boys love anything with wheels! This is now their preferred way of transportation. As a newbie at making the long drive with kiddos, I tried to be all strategic in my planning. I figured if they napped during the day they would fall asleep a little later in the van and we could transport them directly to bed without any disturbance. The plan slightly back fired. They fell asleep later, but they immediately woke up as we pulled into my parent’s driveway at 1:00am. Too excited to sleep we were all up until 2:00am! In addition to baseball, basketball and Easter egg hunts we were able to get some amazing family pictures during our visit. I am sure you will see them show up more than once. After unpacking and catching up on a large amount of laundry, the boys agenda for the day included making the road trip again. I bet your family loved having u!!!! They did and only wished we lived closer!